The Las Vegas roadways can be a very dangerous place. Though, if you live in Las Vegas, you don’t need someone to tell you that. Every day, when walking alongside the road or when driving your car down the road, you see insane drivers who accelerate quickly to try to catch a green light, drivers who swerve erratically around other cars to try to get past them, or drivers who fail to stop at a stop sign or signal. All of this insane driving puts pedestrians (the most vulnerable individuals on the road) at risk of significant injury or even death. Most of the time pedestrians are able to see a terrible driver before they venture out across a Las Vegas intersection. However, a swiftly moving vehicle can sometimes be impossible to avoid when you are a pedestrian and a collision is the result. In these instances, most of the time, the driver will stop and wait for paramedics and police to arrive. Unfortunately, many times, the driver does not stop and that person becomes a criminal in a crosswalk hit-and-run accident. Call the Police: If you are injured, the police must responds to your accident. The police will be able to get witness statements and they will help put the pieces together to help track down the person who hit you so that you can seek compensation for your injuries from the correct person. Gather Information: You will need to do everything you can yourself to try to locate the person who hit you at the crosswalk. Unfortunately, many times, you are not able to rely fully on the police because they are so busy. You or witnesses to the accident (if any) should write down a detailed description of the vehicle that hit you, the car’s license plate number (or even a partial plate number) and also details on when the accident took place. If you or witnesses were able to see the driver before you were struck, it will be very helpful to note the person’s gender, race, hair color and apparel. Passenger detail will also be very important to note. It is understandable if you were not able to get much or any of this information since the accident was likely a complete shock. If you or witnesses did not gather much information, you can look around for traffic cameras which could provide essential clues to help identify the hit-and-run driver. Call an Attorney: An experienced attorney will also have skill in tracking down hit-and-run drivers. With information such as a license plate number (or even a partial license plate number) an attorney can use his/her resources to track down the individual when a police officer does not. Once the attorney successfully tracks down a crosswalk hit-and-run driver, he/she will be able to discover what kind of insurance the driver has (or does not have) and sue that person for the injuries that you’ve sustained. Most Las Vegas personal injury lawyers will do this service at no cost to you because they work on a contingency basis. If you or someone you love was a pedestrian that was struck by a hit-and-run driver, you may be entitled to compensation from the person that hit you. 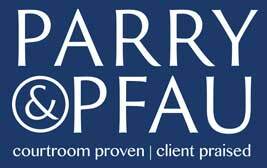 At Parry & Pfau, we are expert at finding hit-and-run drivers and suing these terrible individuals to make sure you are properly compensated for your injuries. If you would like to speak with one of our experienced attorneys, please call 702-912-4451 or click here to request a meeting time. We would be happy to offer you a free consultation and provide you with the information that you need. Newer PostHow Will Nevada’s New Voucher Law Affect Homeschool Education?